Diana Mosley, born in 1910, was the most beautiful and the cleverest of the six legendary Mitford sisters. At eighteen, she married the rich, goodlooking and charming Bryan Guinness, of the brewing dynasty, by whom she had two sons. Together they were a golden couple, at the heart of London society, but within four years Diana had fallen in love with Oswald Mosley, married to ‘Cimmie’ Curzon and the father of three children. Labour Party and was veering towards fascism. 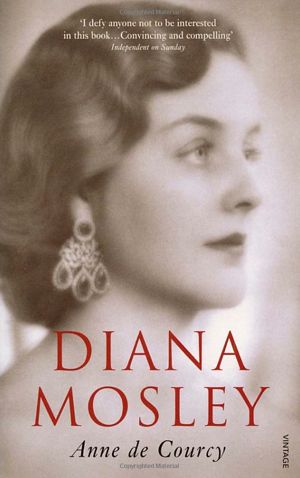 In 1932,four years after her marriage, in an era when divorce was frowned on and discretion a prime virtue, Diana left her husband and set herself up as Mosley’s mistress – a course of action that horrified her family and scandalised society. In 1933 she took her sister Unity to Germany; soon both had met the new German leader; Adolf Hitler. Diana became so close to him that when she and Mosley married in 1936 (after the death of Mosley’s wife), the ceremony took place in the Goebbelses’ drawing room, with Hitler as guest of honour – by this time, Mosley had become the leader of the British fascist party. Diana continued to visit Hitler until a month before the outbreak of WWII, during which she and Mosley were arrested and detained (under Regulation 18B), remaining in prison for three and a half years. For many years afterwards, she refused to believe in the reality of the Holocaust. After the war, ostracised by many, the Mosleys rebuilt their lives, making homes first in Ireland and then in the Temple de la Gloire outside Paris, entertaining and being entertained y pre-war friends and new ones, including the Windsors. Attempts by Mosley to re-enter mainstream British politics failed abjectly but he continued to propound political views. His death, after almost fifty years together devastated Diana. She remained beautiful into extreme old age and, gradually, attained iconic status, with friends and devotees making pilgrimages to the Temple de la Gloire as to a shrine. Diana’s life is of extraordinary historical and social interest, and Anne de Courcy’s telling of it is quite splendid. This is a truly excellent biography, which was commissioned years ago but could not be published until after Diana’s death. It has stood the test of time and reads like a thriller. It is important, for it shows not only how misguided and fanatical some people were, but also how the British more or less unanimously rejected totalitarianism. This gripping volume is a portrait both of an extraordinary individual and also of political extremism in the 1930s. Love her or loathe her, there is never a dull sentence in this portrait of an extraordinary life lived in extraordinary times. A tour de force from start to finish. I defy anyone not to be interested in this book.